In this episode of Soundwaves, hear Quiet Oaks singer/guitarist Dane Sandberg and drummer Spencer Sayer talk about the band’s live-performance finesse and how they’ve translated it to their album Pretty Alright. The other band members include John Butler on lead guitar and Mike Moon on bass guitar. The band began super quickly—the band members had some friends who play in Desert Noises, and after they were offered a spot to open for a Desert Noises show in Nashville, they named their group Quiet Oaks, threw together four songs, recorded an EP in their basement, and left on tour to Nashville in less than a month. Beginning off by touring, many of their songs were created with a live audience. This also gave the band insight into the songs that resonated with others and the songs they enjoyed playing most so that when they got back home, there was a clear direction to take their album Pretty Alright. The high-stakes shows they played for Audiotree helped them get past the nerves of bigger shows and ultimately left them as better artists. Even though they’re a rock band having fun, most of their songs are personal and emotionally driven. Similar to Wilco—as they describe—when you’re not focused on the lyrics, you don’t know the depth of emotion behind the words. They’re deep enough that someone can relate it to their own experience, but accessible enough that any person can do that. 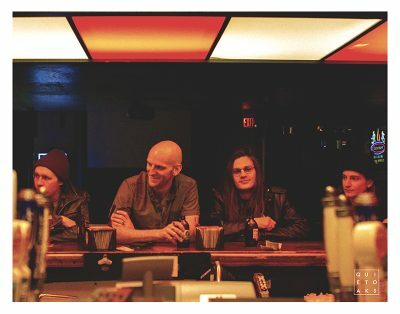 Quiet Oaks release their debut album, Pretty Alright, this Friday, March 17, at their Urban Lounge release show, with support from Andrew Goldring and Strange Familia.